Designed especially for delicate or thinning hair. 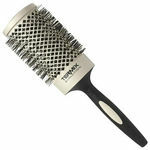 The Termix Evolution Soft Brush features high-performance ionized bristles designed to care for thin and delicate hair. 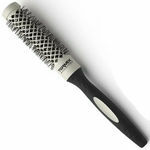 They have a cross-system of thin-diameter ionized nylon bristles and micro-filaments that work together to allow a good grip without damaging hair. 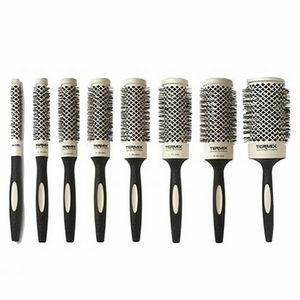 Each brush has a temperature-resistant coating that promotes heat transmission and features large diamond-shaped vents that significantly reduce drying times. 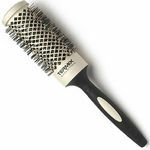 The barrel has been designed to be non-stick, so aerosols and other styling products are less likely to adhere. Each Termix brush has an ergonomically designed handle that's been covered in santoprene, giving it a soft and rubbery texture for a non-slip grip and incredible comfort. 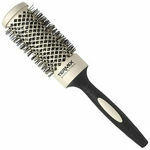 The Termix Evolution Soft features cream barrels so you can quickly tell it apart from the Evolution Basic (silver) or the Evolution Plus (black), to make sure you pick the right brush for your client's hair, every time. 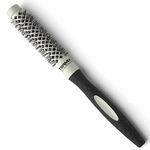 Designed with dense, ionized bristles that provide extra resistance, making it easier to dry and style thick or difficult-to-manage hair.